surrounded by the chirp & giggle of other girls? and stuck his head into the back of the dusty van? 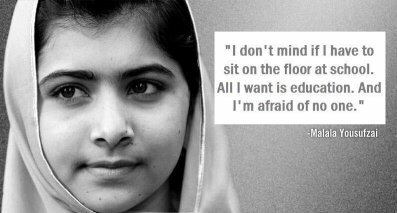 shouting – which one of you is Malala? and punish you for exposing their evil? the burning of schools to sever girls’ education? Eric G. Müller teaches literature and drama at the Hawthorne Valley High School in New York. He is the Alkion Center Teacher Training director. He has written two novels, Rites of Rock (Adonis Press 2005) and Meet Me at the Met (Plain View Press, 2010), as well as a collection of poetry, Coffee on the Piano for You (Adonis Press, 2008). Poetry, articles and short stories have appeared in many journals, anthologies and magazines.